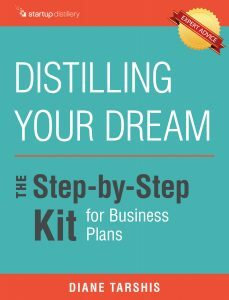 Distilling Your Dream is a step-by-step Business Plan Kit for those who want to turn their dreams into reality but have a limited budget. Tackle the key elements of your business. Develop a roadmap for what you need to do and how you’ll do it. Clearly explain your vision so you can attract investors and customers. Whether you’re just starting out or you need help taking your business to the next level, you’ve come to the right place. There are two distinct parts to any business plan: the narrative (I call it ‘The Words’) and the financial projections (I call them ‘The Numbers’). Likewise, there are two parts to Distilling Your Dream… The Words and The Numbers. The Distilling Process. Explains the thinking and purpose behind each section of a business plan’s narrative. Instructions. Describes how to use the worksheets most effectively, how the worksheets and templates work together and gives you helpful hints. Worksheets. So you can work on each section of your narrative, one step at a time. Narrative Template. Transfer your worksheet answers into a Microsoft Word document specially designed for the narrative portion of your business plan. Executive Summary Template. Distill your business plan into an executive summary. From there you can develop your pitch, slide deck or 1-page summary! The Distilling Process. Explains the thinking and purpose behind each spreadsheet used in a business plan’s financial projections. Instructions. Describes how to use the worksheets most effectively, how the worksheets and template work together and some important reminders. Worksheets. So you can work on each section of your financial projections, one step at a time. Financials Template. Most of your work will be done directly in the template itself. Each spreadsheet is part of a Microsoft Excel document that can be fully edited by you. I’ve built in some basic formulas and included some line items relevant to most businesses. My Business Plan Kit isn’t just a formula you follow. It guides you one step at a time, helping you address all those issues you wish you could ignore, but know you can’t (or shouldn’t). It helps you focus on doing things the right way. Who your customers are and why they are going to buy from YOU. How you’ll set yourself apart from the competition. How much money you’ll need to have at the start so you can pay your bills, as well as yourself. If you have questions, get stuck or need advice, you can add 1, 3 or 5 hours of one-on-one consulting time with me any time you like. Buy them with the kit or later on when you have a question, need advice or want some extra support — you choose! Once you’ve purchased consulting hours, you can call, send me an email or go directly to my calendar to schedule a time that’s convenient. Wharton grad and startup expert Diane Tarshis doesn’t tell you how to write your business plan, she shows you, walking you through the process step-by-step with examples, tips, templates and do-it-yourself worksheets. Diane has been advising early-stage entrepreneurs for decades. Her custom business plans have helped countless entrepreneurs launch successful businesses and secure funding. They also cost thousands of dollars. Distilling Your Dream is Diane’s low-cost/high-result solution for any entrepreneur who has a great idea but a limited budget. This kit is where Diane shares all of her experience and insights – she doesn’t hold back a single thing – giving you the very same guidance she gives her clients.